Magnum Test-C 300 is a long-acting testosterone ester, which is a fairly strong steroid androgenic and anabolic activity. It can be used both in sports and in medical practice. For sports purposes (usually a set of muscle mass and the achievement of the growth of power indicators for the athlete) it is used mainly by men. Magnum Test-C 300 mg in medicine, in turn, is prescribed to both men and women in the treatment of various diseases. The indications for its medicinal use are: for men – dysfunction of the reproductive system and sexual underdevelopment, prostate hypertrophy, acromegaly, and other abnormalities; for women, breast cancer and ovarian cancer, the period of menopause in the development of vascular and nervous disorders, dysfunctional uterine bleeding. For the first time this testosterone ester appeared on the Western market in the 50s of the last century. Its production was engaged in the company Pharmacia & Upjohn. It was originally produced, presumably, for use in the medical field and was used only there. But rather quickly, he was noticed in sports practice due to the multiple intrinsic effects that are significant for athletes. 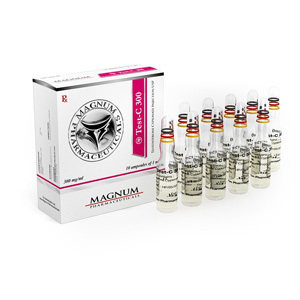 Steroid Magnum Test-C 300 is a fairly powerful anabolic and androgen. Its anabolic activity is 100% of endogenous testosterone. Androgenic – also 100% of testosterone. The effect after application lasts a very long time (the period of activity of the substance is in the region of 15-16 days). This eliminates the need for the patient to perform injections too often (sports injections are usually performed once or twice a full week). And even the elimination of pain in the joints.